Miss Ellie is continuing to grow and do new things. Her little personality is so fun. She's really tiny for her age, but is very spunky. We call her scrappy because she is so agile and can get anywhere including out of the two different attach- to chair- seats we had! So I have been stalking craigslist for about 6 months now waiting for something decent. And lo and behold I found it! One morning two weeks ago, Shane was out of town, and I was...let's just say not my most pleasant of attitudes when Miss Sass decided to once again NOT EAT and climb out of her chair and nose dive to the ground. Thankfully I was close enough to catch her at the last minute. I had had enough! I said a few ugly words in my head and then repented and then got on craigslist. 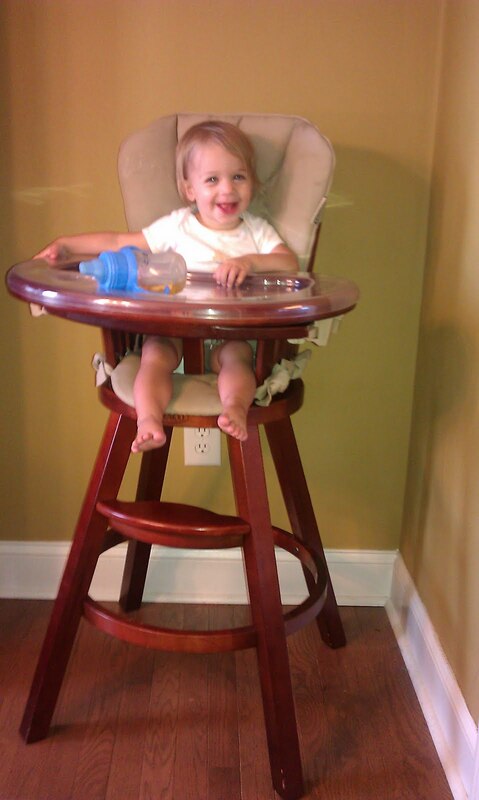 This is the exact highchair I had been stalking on some baby websites, but didn't want to spend $160 on it. I got it for $70! 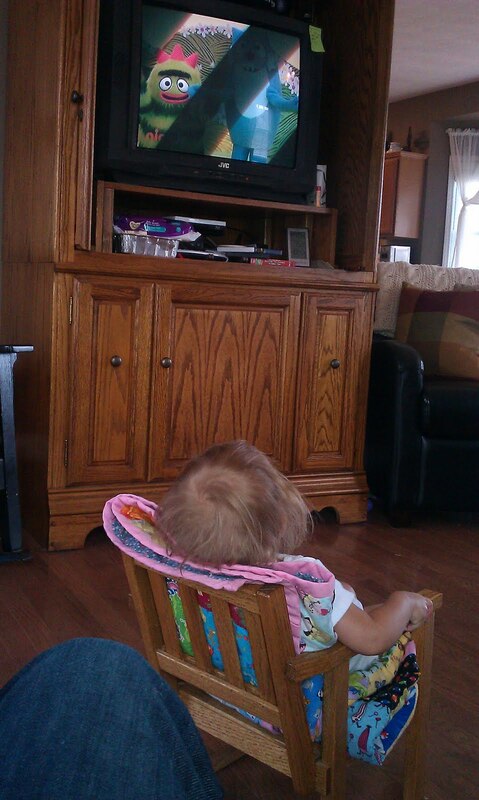 And Princess CANNOT get out of it. Oh the surprise on her face when she tried that very first time. And I could not hide the triumph in my eyes as she looked up at me in frustration. I smiled just thanking God a million times as my eyes closed for the night. Maybe not babygirl will put on some weight! 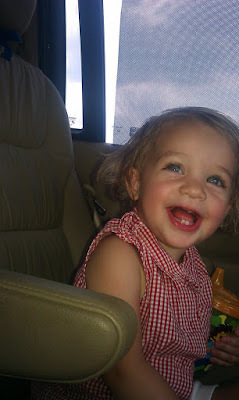 Here she is hanging out in the van while we were at the Mary Ingles Draper farm on July 4th. A downpour started so we headed for cover and air conditioning! This month she finally noticed the television. 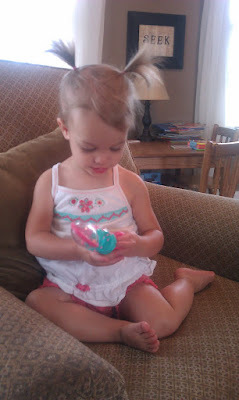 She is so busy that it is hard to get things done as she is constantly into stuff or getting herself into a pickle. So to finally get her to sit for 5-10 minutes has been awesome. 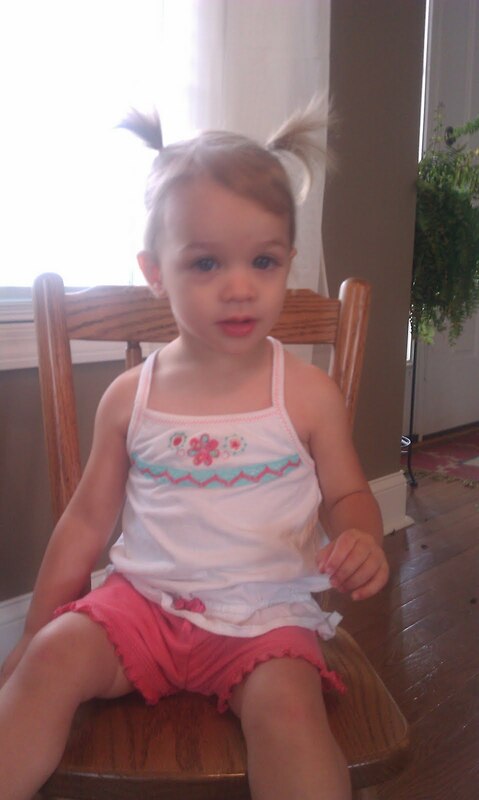 Her hair is finally long enough for her first pigtails. LOVE!! Adorable!!! Miss you guys! Maybe Lily and I can come for a visit soon!